Reuben Ray are the new kids on the block in timepiece design, a newly launched Australian based company, with a great range of both contemporary and classic pieces. I know what you're thinking, not another Watch start-up..... But Reuben Ray really caught my eye with their sleek designs and the simplicity of their branding. I just love the aesthetics of this brand, everything from the beautifully flowing handwriting logo to the understated, minimal feel. First off, the packaging... The watch comes encased in this stunning marbled box with copper branded embossing. It's an unexpected added extra, which creates a special feel to the piece and making it a great gifting option. I couldn’t resist this beautiful contemporary design with the soft grey colour palette and of course the gorgeous rose gold hardware! I love how minimal this design is, the detailing is simple and subtle with a fresh, contemporary feel. The cool-toned grey of the straps works perfectly with my jewellery - I love to mix metals, from silver to yellow, rose and white gold, and this watch looks great with them all, tying the whole look together. 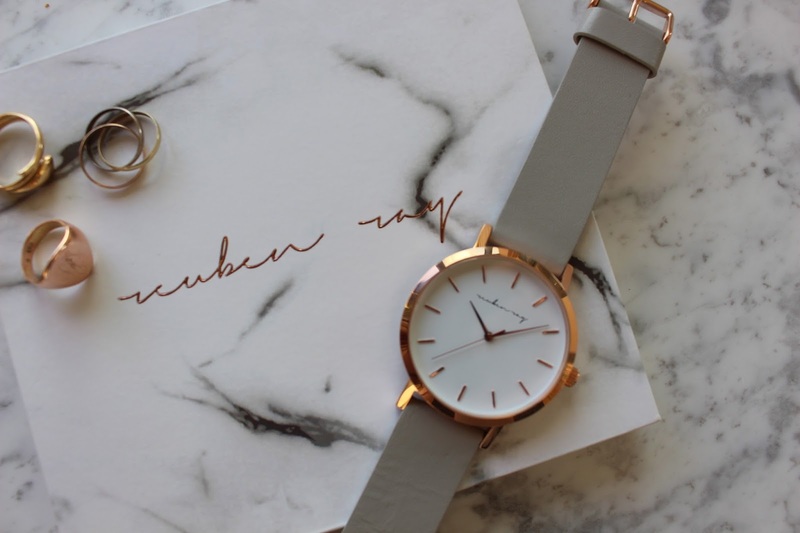 I find myself reaching for this watch most days lately - it's just so neutral and easily paired with my Spring wardrobe!